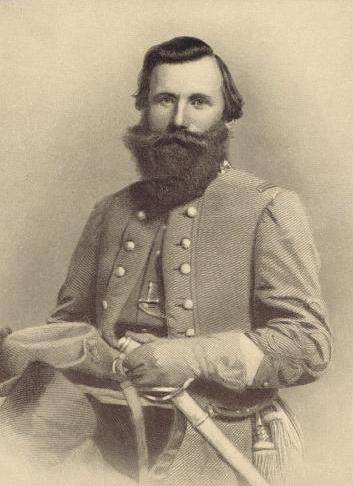 Born February 6, 1833 at ‘Laurel Hill’, Patrick County, Virginia, Jeb Stuart was the seventh child and youngest son of the Honorable Archibald Stuart of Patrick County and Elizabeth Letcher Pannill of Pittsylvania County, Virginia. ‘Laurel Hill’ was a beautiful and fertile farm inherited by Elizabeth from her grandfather, William Letcher. Following his schooling at Wytheville and two years at Emory and Henry College, Stuart was appointed to the United States Military Academy at West Point in 1850. Graduating thirteenth in his class in 1854, he spent most of his time in the U.S. Army with the 1st Cavalry on the Kansas frontier. On November 14, 1855, he married Flora Cooke, daughter of Colonel (and future Union General) Phillip St. George Cooke. In October 1859, Stuart was aide to General Robert E. Lee in the capture of John Brown at Harpers Ferry. When Virginia seceded, he resigned his lieutenancy and entered Confederate service as Colonel of the 1st Virginia Cavalry. Assigned to General Joseph E. Johnston in the Shenandoah Valley, Stuart at once became famous for his exploits. At First Manassas in July of 1861, he defended the Confederate left and led a charge aiding in the Southern victory. Stuart was promoted to Brigadier General September 24, 1861. Before the Seven Days battles, General Stuart made his daring ride around Union General McClellan’s army to reconnoiter for General Lee. On July 25, 1862, he was promoted to Major General in charge of the Cavalry Corps of the Army of Northern Virginia. He performed brilliantly during the action leading up to Second Manassas. At Fredericksburg, Stuart’s Horse Artillery rendered valuable service by checking the attack on General Thomas ‘Stonewall’ Jackson’s Corps. At Chancellorsville, he took command of the Corps after Jackson was mortally wounded. Preceding the Gettysburg campaign, one of Stuart’s fiercest battles was fought at Brandy Station on June 9, 1863. General Stuart continued to perform gallantly and brilliantly until he was mortally wounded at Yellow Tavern on May 11, 1864. General Stuart died on May 12 at Richmond, Virginia and is buried at Hollywood Cemetery in Richmond.